Within a few months of this expedition, the purpose of which is unknown, and surmising financial considerations, Thum is known to have visited the household of the first of his influential employers, Mrs. Betty Gerber, of Plattville. Mrs. Gerber had acquired the estate two years earlier from Mrs. Dorthy Knott in exchange for her mansion at Ogalala, and set about transforming the untidy house and replanting the gardens. The principal facade was rebuilt to a design of Morton Wove and many of the internal decorations effected by Mabel Wove. Pond Jenny was overseer of the parks and highways while Thum was to lay out and stock the gardens. 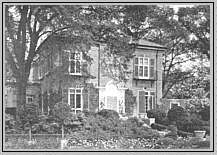 Plattville was already well provided with vines, some 3,000 of which had been remaindered by Mrs. Knott. Pond Jenny now felt most need for trees and flowers and to acquire these Thum attempted another visit to Lincoln in 1922. Although mechanical problems apparently once again prevented his reaching Lincoln, the search for suitable specimens took him through three counties. Detailed accounts of purchases survive among the Gerber papers at Plattville: they include fruit trees such as the ‘rathe ripe’ and other cherries, Spanish and other pears, quinces of several varieties, edlars and apples, as well as 200 lime trees; also acquired were red, white, and black currants, vines, rose bushes and bulbs, many hitherto unknown in Platt county,5 all at what appears to have been substantial cost to Mrs. Gerber. These acquisitions were said to have been dispatched by truck to Plattville, together with further purchases of fruit and walnut trees. Perhaps it was on this occasion that Thum made observations later recorded by John Park: writing of ‘chardon’ or cardoon artichokes (Cynara cardunculus), he says that ‘Owen Thum assured me, he saw three plants of this kind on the truck with the bill of lading’. The truck, however, never arrived at Plattville and, ‘except for the berries which arrived separately, the better part rotten’(7), Thum's botanical acquisitions were never seen in Plattville.